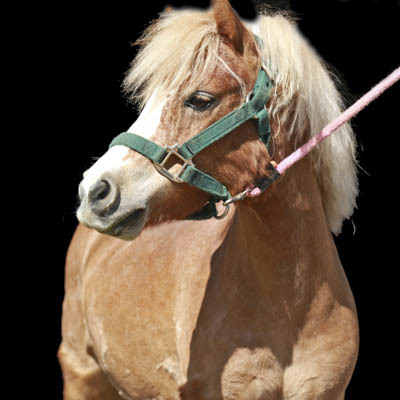 Petunia is a Palomino Miniature Horse Mare and she stands at 8HH. Petunia was born in 2008 and came to PARDS thanks to an Anonymous Donor. Petunia came to PARDS in 2009, and due to her young age she was not used in the lesson program right away. Instead, she joined Hot Wheels on the PARDS greeting committee. Pull into the PARDS parking lot and you can be sure Petunia will be at the fence looking for some attention! As she grew up, Petunia was used in the summer programs…who needs a canvas when you have a willing pony to paint? PARDS was growing too. An Equine Facilitated Learning and Wellness Program (now known as Youth Leadership) was added, and Petunia had a large role to play in this. Her assertive nature provided some excellent teaching opportunities for the youth enrolled in this program. Petunia is now working hard in our Cart Driving Program. Cart Driving is offered to clients who cannot take part in horseback riding due to a disability that has a contraindication to riding, or a weight issue. It is also offered to clients who are looking for a different or additional challenge.